Hi Bacolod Food Hunter readers! We’ve got an extra sweet treat for you this May! Decorated fondant cakes have recently become very popular. It seems that everyone wants their cake decorated with elaborate decorations and cute animals or objects! 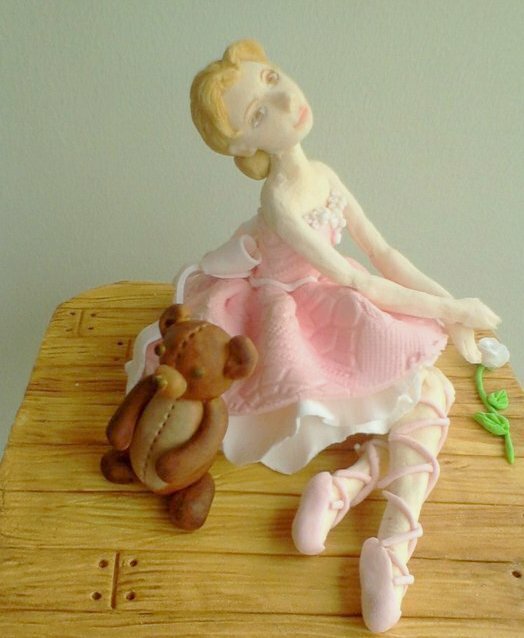 We bring to you our interview with Lorraine Yusay, one of the youngest and rising star gum paste sculptors in Bacolod! We hope you enjoy this article as much as we enjoyed making it! BFH: Could you please tell the readers who you are? Just a short introduction will be fine. LM: I’m Lorraine, i’m originally from Kabankalan, I used to run a cake business there. After a year I gave my business to my mom and moved here to Bacolod for more experience. BFH: So I was at chefs and bakers and I saw these absolutely cute and stunning decorations… what are these things called? cake toppers? Koalas having party on a giant cookie! This cute bear is just asking for you to come and play with him! LM: They are cupcake toppers, but they can still be used on cakes. Most likely on novelty cakes. BFH: I was even more surprised when Chefs and bakers told me that you made them. They are so cute! How did you get into sculpting? I started when I was a kid with a set of play dough…and I would continue playing with clay until college actually. BFH: Aha! I thought so!! When I saw your stuff I thought to myself, this person probably made a lot of clay figures! BFH: Did you take a course in sculpting or are you self taught? LM: I’m very much self taught in sculpting and mixing colors. I can remember the containers of clay that I would use up just discovering different colors as a kid…my mom would scold me almost every time because of my mess. BFH: But now you can look back and say.. look mom, my mess is earning me money! A big order of Lalaloopsy dolls. BFH: Where do you get the inspirations for your designs? You have so many! You have bags, pandas, bears all sorts of cute things! LM: Usually I just receive a concept or theme and work from there and if there’s something I don’t know or haven’t seen yet, I search about it and from there I try to create toppers. BFH: Your animals are so cute BTW, I can’t get over how cute they are! LM: Sometimes its the little details that makes them look a bit more special. BFH: Which do you enjoy better, sculpting bags or animals..? LM: Ooh thats hard, I think that would have to be miniature food! BFH: Your bags are amazing too! LM: Thanks! those were my first bags made out of gumpaste. BFH: Wow? first bags? They look very well done! LM: Yes Thank you! I couldn’t stop making them the other day! Its funny to start from clay and end up with gum paste. I only discovered cake decorating during my senior year in college. BFH: Really? Who introduced you to cake decorating? LM: I was on fondant application and pipping. Our theme was 25th anniversary. We finished 4th… so much for the first try… <laughs> I competed again with my team a few more times and we got first place twice! BFH: Do lots of people order from you? BFH: Is this a full time job for you or just a hobby? LM: I plan to do this full time, that’s why I’m saving up for new equipment. It can get expensive because some of the tools are quite pricey but its still a big investment once you have them. BFH: What is your advice to people who first start out in sculpting.? LM: If you’re starting out in sculpting, a little patience goes a long long way. Don’t be disappointed if your finished product is nowhere close to what you imagined just play with it a bit and eventually you’ll end up with what you want. Take pics of all your work, and compare the old ones with the new and then for sure you’ll realize that you’ve improved on your skill. Oh for those who are intimidated with working in gum paste they can always practice with clay first to get a feel of how to sculpt.You can always use it re use it again and again, so you wont end up spending a lot. BFH: Is it the same? Gum paste and clay? LM: The consistency is pretty much the same. It’s saved me a lot of dread when I was starting out. That’s all for our interview! I hope you guys enjoyed our special sweet article! Don’t forget to help us out by clicking on the ads found on our website! Lorraine can be contacted at her facebook page: Top that Cake. Some of the pictures in this article were production photos taken by Lorraine. Previous Post Miracle Berry: Turn sour tasting things into sweet! Next Post An interview with Abby of Flibby’s sweets and treats!